If you work for an employer but you’re bursting with energy and ideas to start your own business or initiative, then you’ve probably been wondering how to go about leaving your job and starting a new career and building a life you love. 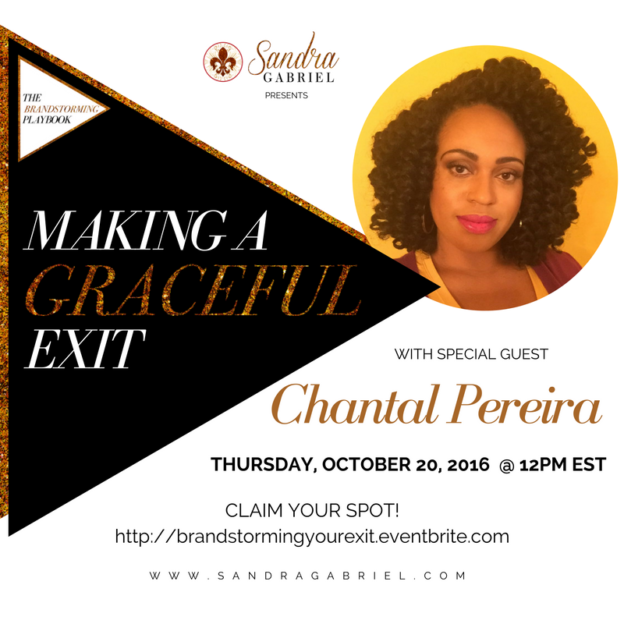 Join me and founder of BetterMe Management, Chantal Pereira as we uncover how to make a graceful exit from your job. Chantal and I are going to cover topics that include preparing for your exit financially, mentally, emotionally and spiritually. BetterMe Management is dedicated to offering quality human resources , organizational design and strategic planning solutions to its corporate clients seeking new ways to rejuvenate their business and increase their profit. As a life strategy and design coach, Mrs. Pereira is responsible for working with clients to help them discern their purpose, as well as develop their blueprint to ultimately use those gifts in their career, as an entrepreneur or within their community. She has a passion and gift for partnering, mentoring and coaching individuals and groups so their successful and fulfillment can pave the way for others. Looking to the future of BetterMe Management, she aspires to continue to grow the business, brand and leave a legacy of flourishing families around the globe. The session is free, but space is limited so CLAIM YOUR SPOT NOW!